You won’t need to spend months in a boat-yard. You can go cruising immediately, because we are cruising right now on this boat. You can step aboard as we step off. We take a good care of our little boat. She’s a lovely home and a great performer at sea. The equipment is minimalistic, but we rarely wished for more. We’ve put a lot of thought into transforming Janna into a cozy, but utilitarian vessel. It is our home and an office. We are the third owners and we are selling Janna for family reasons. These are the most important features that make Janna what she is (see more below). She is a perfect home for a couple, however, four people will find comfortable berths on board. Two on the V-berth and two in the cabin. The cabin settee cushions fit nicely in the cockpit and you will spend many a night there. We have kept only 3 seacocks (out of 10) – one for the seawater intake, one for the galley, which doubles as a port cockpit scupper drain, and one for the second cockpit scupper drain. The galley is well designed and we have never had water coming through the galley sink, even in foul weather. Two large storage lockers are right next to the galley sink. 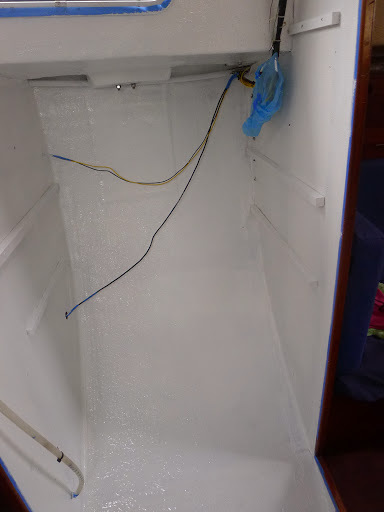 We have converted the quarter-berth into another locker accessible from the cockpit and made special drains which keep the lockers dry in all weather. We have also made a heavy-duty rail guard for the stove and the pots stay put even in bad weather. In really bad weather we cook in a pressure cooker (our most useful utensil). There are two 5kg aluminum LPG cylinders on the deck. They usually last two and half months – but we cook a lot and bake regularly. The LPG is carried via a single high-pressure hose, thus minimizing the points of failure. 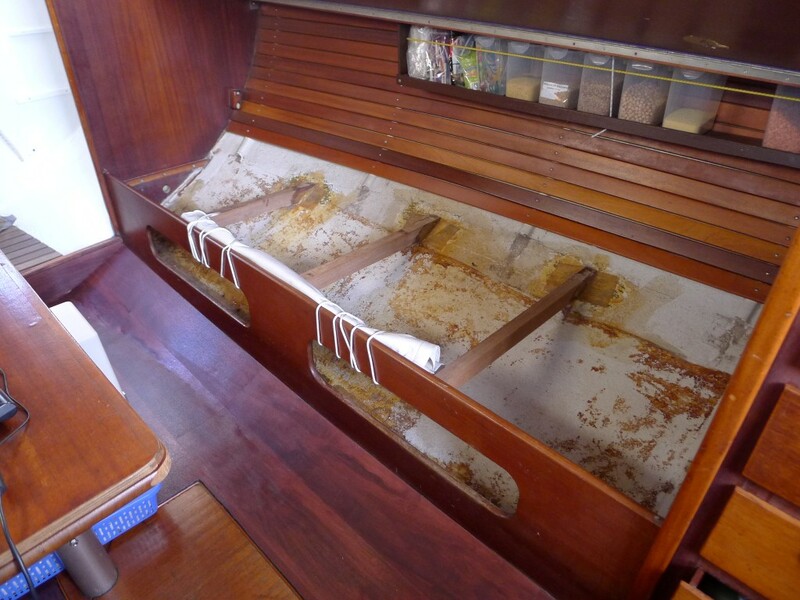 Previous owner added a strong 3’ stainless-steel bowsprit and a roller furling genoa. This allows for extremely easy wing and wing setup for downwind passages. The genoa is a real workhorse. There is an inner forestay for hank on sails: light genoa for light winds and short tacking and reefing jib, which doubles as a storm jib. There’s another spare jib. The virtually frictionless Cape Horn windvane will steer the boat on any point of sail, including downwind even in light winds. Maintenance is a piece of cake. Halyards lead to the cockpit. This is great for single-handlers or your partner who can remain in the safety and comfort of the cockpit during the sail changes. Only hank-on jib halyard ends at the mast, which makes it easy for the crew handling the jibs to control the sail. Occasionally we have used also a downhaul for the jibs, which makes pulling the sails down in strong winds safer. We have ordered new large mainsail, with extended roach, as well as very light hank-on genoa. Both sails provide extra power and make short tacking in light winds very enjoyable. Since we bought a 20kg Rocna, we’ve never dragged, even on a shorter scope. The chain is of prime quality, made by Acco. There are two more CQRs, spare piece of chain and about 200m of three-strand lines. A folding table fits in the cockpit and six people can enjoy a dinner in reasonable comfort. The cockpit is relatively deep and you will feel save even in foul conditions. The cockpit sole can be lifted, which provides a great access to the engine room, which makes regular maintenance so much more enjoyable. Engine can be easily lifted out of the boat using the boom. You can see our adventures and most work done on Janna on our blog http://www.klubko.net/en/ (or the Czech version which is more complete). You can also visit our Google+ albums and click through to see the details. Boom gallows 2013 Teak timber and SS 316 tubing. Provides great holding for crew on watch and a rest for boom while at port. Cockpit coamings 2013 New teak for cockpit coaming under the winches. Cockpit teak 2012 Rebuilt the teak in the cockpit, created a new locker. Added scuppers under the locker lids (2013). Depth sounder 2009 Raymarine ST40 Bidata. Mounted inside of the hull for easy maintenance. Speed log included, but not installed. Energy – batteries 2013 N70 starter battery, 225Ah house batteries (2x Trojan T-105 Plus). Charged separately via isolator switch. Engine – heat exchanger 2011 Replaced due to corrosion, caused by original faulty installation, which was resolved by the new exhaust raiser. Rocna 20kg. Never dragged since we got her! Non-skid 2013 New non-skid on deck, International Perfection and Intergrip. Three overcoats: does not slip while kind to your bare knees. Portlights 2012 Replaced gaskets. Very easy maintenance. Most blocks replaced with Harken, couple of spares. Rigging – twin boomvang 2009 Blocks and lines. Works great as an instant preventer. Easily controlled from cockpit. Safety – leecloths 2013 There is no quarter berth, but off-watch crew sleeps comfortably behind a lee-cloth on either side of the saloon. Sailing dinghy 2009 Walker Bay 8’ with sailing rig and oars, stowed on the coach roof under the boom. Easily lowered or hoisted with a 4:1 tackle attached to the main halyard. Stove 2009 Force 10, four-burner with added heavy-duty rail guard. Not gimbaled, but with larger pot or pressure-cooker works great even in heavy weather. Toilet Failsafe bucket ‘n’ chuck it system. 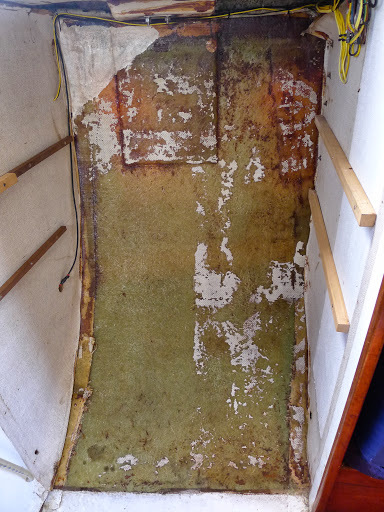 Original mounting platform has been preserved and toilet can be easily installed during a haul-out. VHF – AIS ? GME GX558A, converted into an AIS receiver. Connects to a computer via USB. Leaving on a Friday is said to be inauspicious, but we were only sailing some 30 miles to a small island Pulau Tiga, where we planned to anchor for the night before crossing to Labuan, which lies some 40 miles SW of Tiga. That day we finally had strong enough wind to shut down the engine and sail, though of course the wind was once again against us… The weather reports predicted squalls and heavy rain, and sure enough, short after we made it to Tiga and dropped the anchor, the first squall hit us. Our hopes of sleeping in the cockpit were quickly abandoned as we hid ourselves inside the cabin from where we watched the terrifying lightings that were hitting the sea all around us. While amidst one of my melancholic broodings I tried reading a book, Petr busied himself reassembling our tiller pilot to see if the repaired circuit brings it back to life. Unfortunately the miracle didn’t happen and we had to face the gruesome fact that we would have to hand steer while motoring all the way to Singapore where we could buy a new tiller pilot. Yet we were not desperate, because at that point we were still hoping to see some of those monsoon winds?! Rather than a job-relating illness or injury, in Czech this term refers to a strange behavior of people from different branches, who become so overwhelmed by their occupation, that they cannot cut themselves off from it even in their personal or everyday life. Let’s say a dentist always checking other peoples’ teeth while chatting with them or a teacher constantly trying to lecture everybody. You get the idea, I guess. Though this occupational disease is highly contagious, not every person becomes affected and some do more than others. I suppose it also has to do with that particular person’s personality and his or her current state of mind. I myself am rather a perfectionist and don’t mind fiddling with details. No wonder then, that after three weeks of painting, I have been exhibiting some symptoms of “painting disease”. We are back in the working mode, getting up at dawn (round 6 am) and going to bed soon after 9 pm, exhausted but happy. We sleep so soundly these days, that often we don’t even hear the raindrops pounding on our deck. We sand, we glue, we paint and Janna slowly but surely undergoes a cosmetic metamorphosis. It’s amazing what a huge difference a paintbrush and a tin of paint can make. It’s been several days now since we lifted our engine out of the boat and put it on the pontoon next to us. Yet we are still in the process of material hunting. Currently we are shopping for new engine mounts, some SS to modify the current engine bed and after we found out that a new damping plate (between the gearbox and flywheel) plus shipping would cost us some 800 USD, we also added 4 small rubber cones to our list – after all it’s only these small rubber thingies that are broken. We haven’t had much luck in Kudat so far. Luckily we live in the internet era. We easily found several engine mount dealers, some of them in Asia (mostly based in Singapore) and some in Europe, where we bought engine parts for our Volvo before. However, it seems that we will actually order our new engine mounts from a US internet chandlery go2marine.com. They are relatively cheap and the mounts will be sent by UPS, so could be here within a week or so. As for the rubber cones for the damping plate, we decided to send them to Taiwan. In Kaohsiung there is an excellent shop where we always bought hoses, gaskets and other rubber materials. They also do custom work and since we have a sample – luckily one of the cones is more or less intact – we hope they would be able to find us the same material and make us new cones. Now we are searching for some steel to modify our engine bed. In the afternoon we go to a Mr. Chin’s workshop – a local Chinese machinist, who promised to try to find us some steel angle and also some 316 SS for our new shaft. The advantage with Mr. Chin is that we can speak Chinese to him. Most of the Malays speak some basic English but it’s not enough to discuss technical stuff with them. Hopefully Mr. Chin’s hunt will be successful, otherwise we would have to go to Kota Kinabalu and try our luck there. Which actually is not such a big deal either, since we could also do some provisioning while down there. Month and a half ago when we sailed away from Philippines and arrived to Kudat, a small town in Sabah, also known as the „Land Below the Wind“, we thought we finally left all those potentially disastrous typhoons far behind. Turns out not quite so… Although it rarely happens that a typhoon ventures that south as Borneo, these cyclonic monsters can influence weather even in regions hundreds of miles away. And so here we are, already two weeks helplessly trapped in Kudat. It’s not that a typhoon’s path is predicted to go anywhere near us, but last week it was the super typhoon Usagi and now another typhoon Pabuk that is sucking in and thus intensifying the monsoon winds, which blow from south-west, i.e. exactly the direction we want to travel. 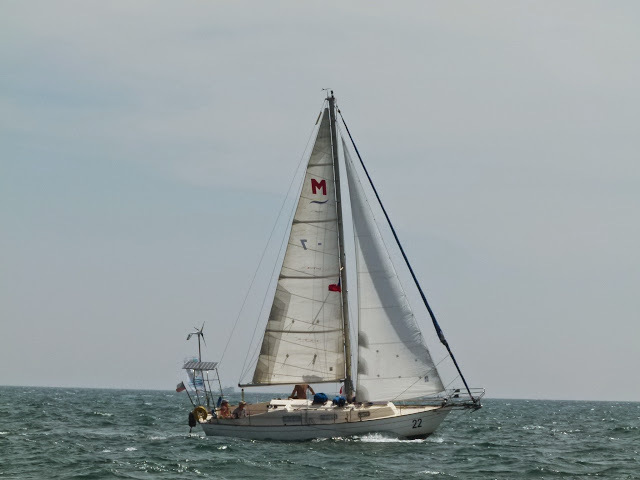 The wind itself would not be such a problem, but the local waters are infamous for serious currents, that are strongly influenced by monsoon winds, and to sail on a small yacht not only against the wind, but also against a 2 knot current is not really much fun. You can receive updates on new posts via email. Just click here. Copyright © 2019 The Joys and Sorrows Of a Life At Sea - All Rights Reserved.